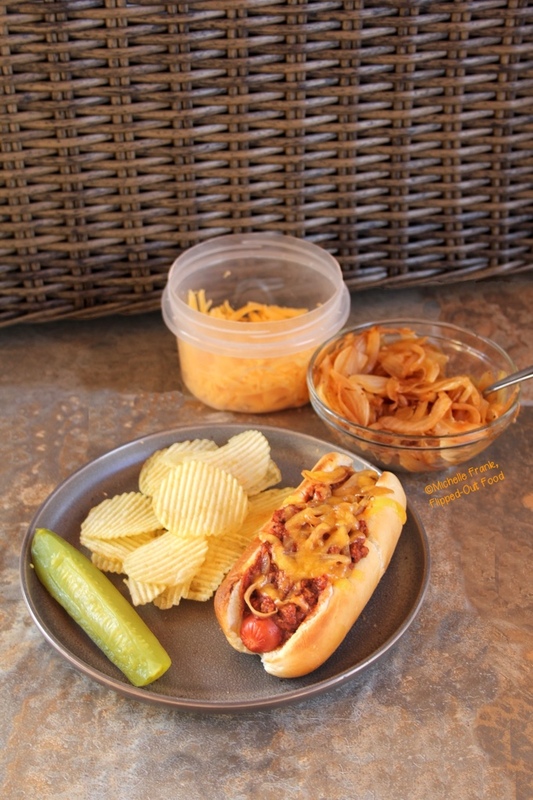 My Ultimate Chili Cheese Dogs are a slightly healthier version of the classic naughty comfort food fix. In a sign that Spring is finally here, today is opening day for Major League Baseball—yay!!! I thought that a recipe involving hot dogs would be perfect for the occasion. I have to admit to a guilty pleasure. One of my favorite things to do—for DECADES—has been sneaking to the closest Sonic and snarfing down a footlong chili cheese dog. This is something my sister and I still do when we are feeling especially naughty. However, in my opinion, Sonic footlongs aren’t what they used to be. A few years ago, as Sisty and I were contemplating a Sonic run, she said, “I bet you could make them better.” I decided to accept the challenge. Of course, I didn’t make the buns or the franks. These were both bought. I picked non-fussy buns, since anything else would detract from the “awesome sauce” that is the chili. I used higher-end franks: I didn’t realize at the time that they were smoked, but that turned out to be really delicious. I DID make the chili. My original intention was to create a copycat Sonic chili recipe. But I decided instead to simply make my own chili that would be delicious on top of a hotdog. My sister and I have since been back to Sonic for comparison: we both like my version better. Usually if I’m making a big pot of game-day chili, it has broth (that almost always involves dark beer! 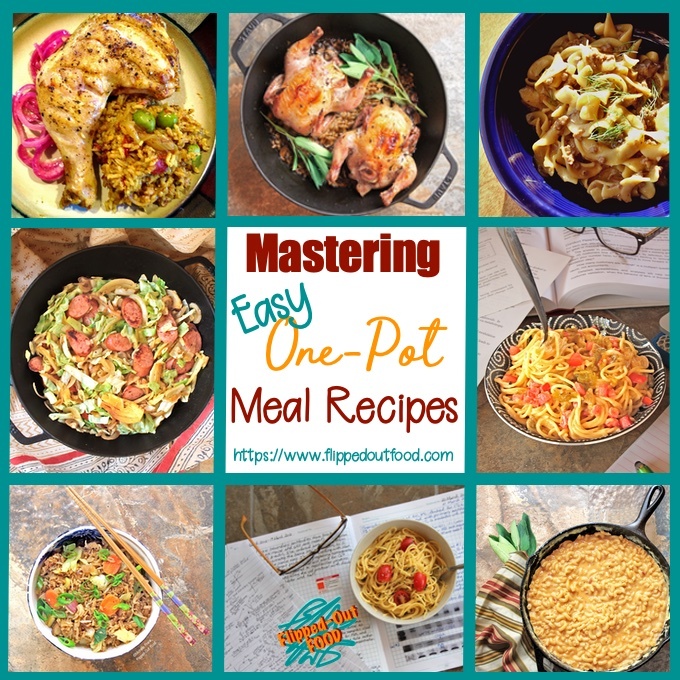 ), ground turkey or beef, chunky tomatoes, onions, beans, sliced jalapeños, and minced garlic. But CHILI DOG chili needs to be tighter and denser. So I used ground turkey, crushed tomatoes, sriracha ketchup (a Godsend, trust me! ), chili powder, and cumin. After first tasting this chili, Phil told me that he’d like to have the chili this way from now until forever. 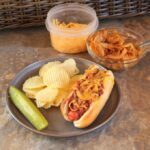 Another must-have with my Sonic dog fix is grilled onions: I sautéed some sweet onions until golden, which takes 20–25 minutes. For cheese, I simply used grated cheddar (mild to medium works well). To sculpt the whole affair, I put golden onions on the bun, followed by the frank and copious amounts of chili. I topped this with cheese. Then, I popped the dogs into the oven under a low broiler for a couple of minutes to finish the job. The result was messy, ooey-gooey awesomeness on a paper plate (okay, okay—I upgraded to a ceramic plate for photography purposes). The leftover chili is fantastic by itself or as a topping for baked potatoes—yet another fun, DYI dinner. You can caramelize the onions and make the chili in advance, then refrigerate for up to 2 days. With that advance meal-prep, dinner is a simple matter of assembling the chili cheese dogs and broiling to melt the cheese. I hope you love these chili cheese dogs as much as we do!! 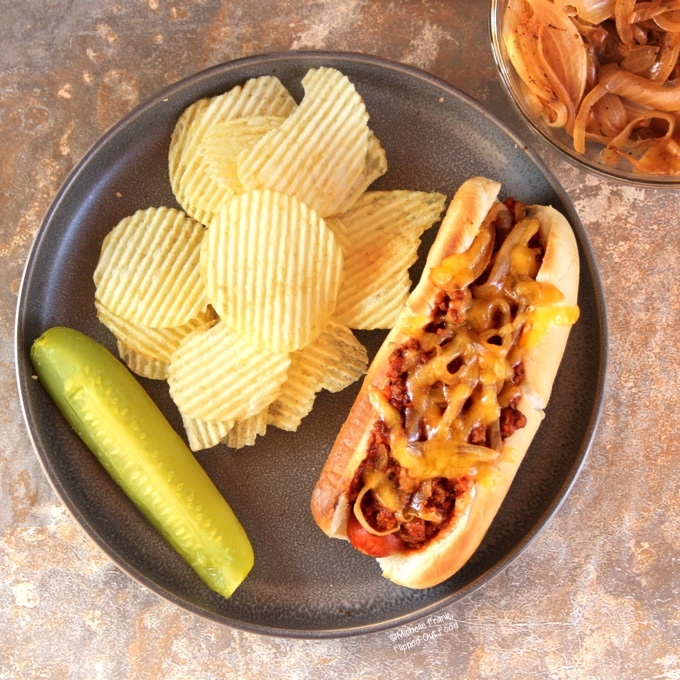 Chili Cheese Dogs are the ultimate naughty comfort food fix. 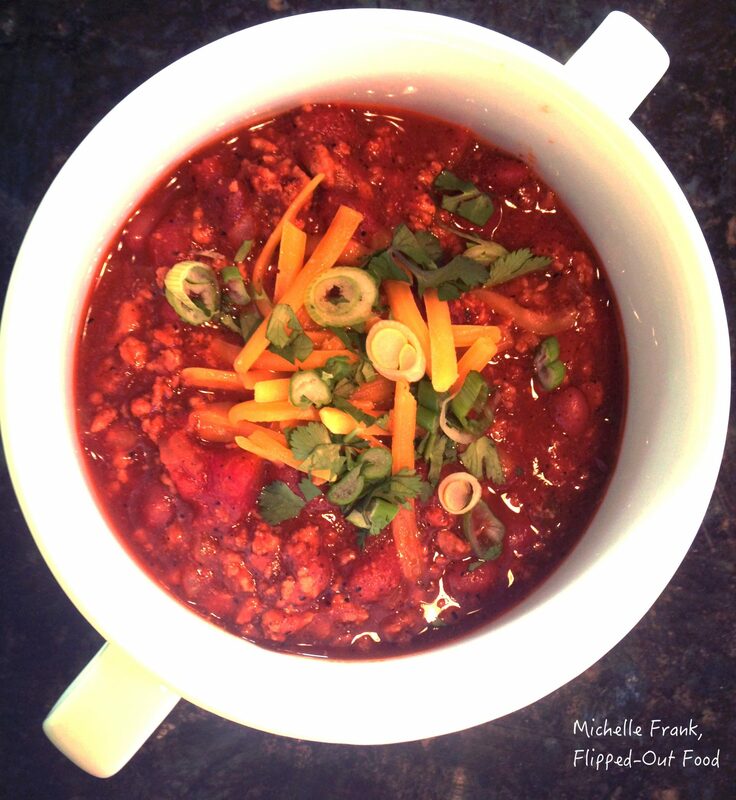 My thick homemade chili starts out with ground turkey, so this recipe is a bit lighter in calories than the typical junk food classic. If you make the chili and caramelized onions in advance, you'll have a quick easy dinner after your busy workday! Set a skillet over medium heat and sauté the onions in vegetable oil until golden, stirring frequently. Meanwhile, sauté the ground meat in a heavy-bottomed pot or skillet over medium heat until browned and fat has rendered. Drain. Add back to the pot and mix in chili powder, cumin, salt, and pepper. Sauté until fragrant, then add 1/2 of the can of crushed tomatoes and the ketchup. Gently simmer for 15 minutes. Check the consistency: if you want looser chili, add more crushed tomatoes until you reach the consistency you prefer (keeping in mind that thicker chili works best for hand-held chili dogs!). As the chili simmers, prepare the franks. Get a good sear on them in a cast-iron skillet or grill pan over medium-high heat. Roll them every couple of minutes to get an even sear all over. You can also opt to toast your buns, either by putting them in the toaster oven or in a skillet coated with cooking spray. Assemble your dogs: for example, I like to put a layer of sautéed onions on the bun, followed by the frank and copious amounts of chili. Then I top with cheese and put it under the broiler until the cheese is melted. I like topping with a sprinkle of fresh onions, et voila. Enjoy! Ground turkey, chili beans, tomatoes, and all the fixings combine to make a delicious, comforting bowl. That is s such a fab way to have hot dogs! DELICIOUS!!! Really love the sound of sri racha ketchup in your chili too – that’s what you call game changing secret ingredient 🙂 Proper comfort food in a bun! Thanks so much, Jo! Sriracha finds its way into a lot of my cooking (or simply as a garnish). It’s the BOMB. YUUUUM! These look amazing! I’m ashamed to say I’ve never had a chili cheese dog. I don’t think hot dogs are as popular here in the UK but they should be. You’ve got me really craving one of these now! Whoa, NEVER?! It’s high time, I’d say! 😛 Thanks for stopping by, Mimi!